Although I have nothing against Mr Burnham or his work, it's hard to be inspired about saving a work of architectural art -- with almost nothing to look at ? Fair point SDR. Here are some photos. The interior is pretty rough, but has some nice features. I feel like if someone did a sympathetic restoration, with a two tone (or more) paint job on the exterior, and had the paint stripped off the woodwork and some period appropriate wall coverings and furnishings for the interiors, it could really shine. I wish there were floor plans. Well -- you do realize you'll now have to turn in your official Wright Wrenderer badge and certificate . . . ?
" . . .vast historical and cultural relevance" ? If you (or they) say so. If multicolored, like a San Francisco "Painted Lady," it would make a swell fun house for the school kindergarten. Leave it where it is ! I get the feeling that this is the Burnham office's 34th mansion job of 1883, and that the spirit may have gone out of the thing, a bit ? The swoopy stair wainscot is a tour-de-force of technical accomplishment, if a bit over-the-top (no, I didn't say "vulgar") . . . Guess it's just not my cup of tea. Interesting that it had descended to a 12-unit apartment house. There will be some recreation of detail to be done, in the upper reaches, I imagine. I realize I'm a bit of a heathen on this forum, and just earlier today admitted to liking Victorian and a variety of Russian styles on a different thread. For better or worse, I tend to like a lot of disparate things. Regarding the colors, I'm not advocating for a SF Painted Lady. But having the siding a different color from the trim, especially if they were both something dark, I think could look very fine. Is the text hyperbolic? Probably. Is the house Burnham's best work ever? No. Is it worth saving? Definitely, in my opinion. 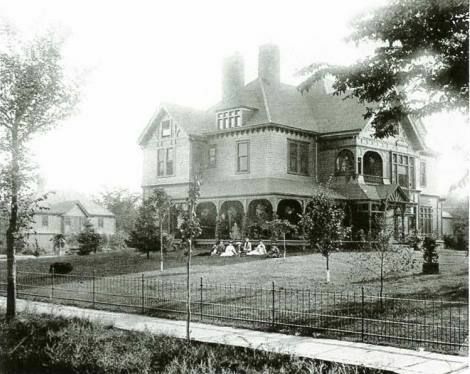 While it may be the Burnham office's 34th mansion of 1883, I'm pretty sure mansions 1-33 are all gone. Many of Burnham and Root's best office buildings are no more, and my understanding is that the firm's residential work has fared even worse. With what appears to be not many left, it would be a shame to lose another one. And it is still a handsome house. Besides, I'm sick of historic buildings being demolished for parking. to make sense in monochrome -- if not a very dark brown, or something ? I do look forward to seeing this house restored . . . Kudos to the fool (ahem, architect) who's willing to move this ark. No Wright-scaled stone chimneys to worry about, anyway. There's nothing wrong with an eclectic taste; I don't really trust a person who has a one-note library ! A heathen you're clearly not . . .
What the façade shows is a mastery of composition that was part of the larger trend of its day that led a charge against those Victorian nightmares you seem to relish (for which you might very well be in danger of having to forfeit your decoder ring). Considering Burnham's connection to FLW, I see no problem with supporting the preservation. When the other house, the one by Van Bergen, was in danger of being demolished, no one here had any trouble rooting for its preservation. Of course, JVB is a lot closer to FLW than DHB or JWR are, but it was out of the earlier houses that FLW emerged. The house has been enlarged through the years. This historic photo shows things as they should be. Hopefully Chris Enck will restore it to the original configuration after the move. creative and knowledgeable architects from that of lesser designers and, along with gathered groups of openings, strikes one as "modern" in effect. Whether this is so as a result of our absorption of more progressive work like that of the Craft architects and of Wright, or not, will require some introspection. The Burnham House has much to do with H.H. Richardson and early McKim, Mead and White. It was meant to be an architecture that is uniquely American in spirit and detail - not sure what horizontality has to do with it. Regardless, it is wonderful example of Burnham and Roots' (mostly Root, from what I can see) early residential work, and definitely deserves the support of any and all architectural and historical enthusiasts. modified, was just something I noticed, and not of much importance. To me it's a counter to the free placement of other elements on the facades . . .
outside in, thank you very much for posting the historic picture! I think we can all agree that the house has had a disservice done to it by the alterations. It originally was a very carefully rendered composition and has lost quite a bit by the minor changes. Looking at google street views, it appears that most of the porch has been removed or altered, the balcony over the main entrance enclosed, and that charming four part dormer window has been modified. Most interesting to me, though, is that the photo clearly shows two large chimneys that are near to each other, while the current house only has one. It makes you wonder what changes have been made to the interior? The addition of the sun room on one side (and presumably the porte cochère on the other side) seem to me to be an attempt to make the house more modern. Those elements seem to have become very popular around 1900-1910 and I wonder if many of the other changes were made at the same time? What has been removed were really the most Victorian elements on the house and I wonder if most of the alterations were carried out at that time. It's possible the white paint dates to about then as well. Remember, in the 1920s, the rich were building huge, often white painted, houses in the Colonial revival style, and much of these changes seem to anticipate or be a part of that trend, in my opinion. I think we were judging the house far too much on its current condition rather than the original architectural intent. The more I look at it, the more I see what a really fine house it is. My admiration for Burnham and Root (Root especially) is growing. If you zoom in on the historic photo, you can see that the columns at the main entrance are actually pretty elaborate. They are definitely on the Carson Mansion side of things.